Home of the fine Champagne wines. Partie Meridionale du Gouvernemt. General de Champagne qui comprend la Champagne propre, le Vallage, le Bassigny, le Senonois, et une partie de la Brie et du Perthois. 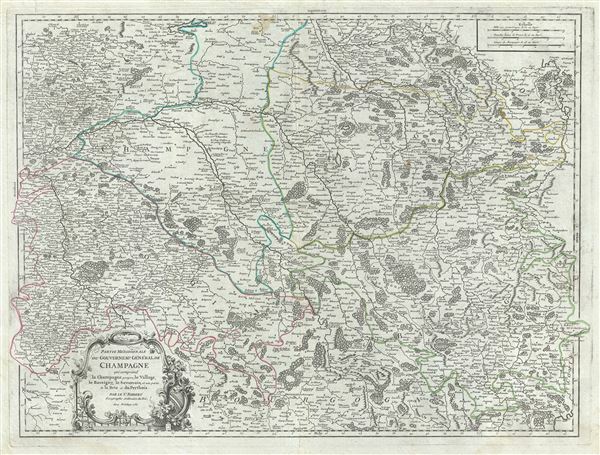 This is a beautiful 1752 map of the southern Champagne region of France by Robert de Vaugondy. It covers part of the Champagne-Ardenne and Burgundy regions of northern France from Bar-le-Duc south to Montbard and from Saint-Fargeau east as far as Neufchateau, and includes the whole or parts of the modern day departments of Aube, Marne, Haute-Marne, Cote-d'Or and Yonne. The map rendered the entire region in extraordinary detail showing roads, canals, rivers, cities, villages, chateaux, etc. The Champagne region is famous around the world for its spectacular sparkling wines of the same name. The map is centered on the department of Aube. The regions of Aube and Yonne are known for their production of Chaource cheese. Chaource is a cow's milk cheese, cylindrical in shape. The central pate is soft, creamy in color, and slightly crumbly, and is surrounded by a white penicillium candidum rind. The Haute Marne region is known for a variety of wines from the Coiffy-le-Haut vineyard, champagne from Rizaucourt-Argentolles, and the local favorite, 'Choue' beer. It is also famous for its production of Langres, a salty cheese with a pronounced odor. In the top left quadrant the region if Brie is noted. Part of the Seine-et-Marne department, this region produces a wide variety of wines and hosts an annual wine and cheese fair. This area is known for its production of a brie-style cheese called 'Fromage de Meaux.' Over 25 liters of milk are used produce just one wheel of this raw-milk cheese. When ripe, its rind breaks at the slightest touch, allowing the beautiful, hay-colored, almost liquid paste to ooze out. The map also includes part of the Cote-d'Or, a premier wine-growing region of France. It produces what are arguably the world's finest, and most expensive Pinot noir and Chardonnay wines. Historically the province of Champagne was bounded on the north by the bishopric of Liege and by Luxembourg, on the east by Lorraine, on the south by Burgundy, and on the west by Ilele-de-France, and by Picardy. Along with the other original French provinces, Champagne was abolished as a separate entity in 1790. A fabulous decorative piece for perfect for wine store, Champagne wine cellars, and French restaurants. A beautifully engraved title cartouche adorns the bottom left quadrant of the map. Drawn by Robert de Vaugondy in 1752 and published in the 1757 issue of his Atlas Universal. The Atlas Universal was one of the first atlases based upon actual surveys. Therefore, this map is highly accurate (for the period) and has most contemporary town names correct, though historic names are, in many cases, incorrect or omitted. Very good. Some wear and verso repair along original centerfold. Original platemark visible. Minor spotting and offsetting. Rumsey 3353.031. Pedley, Mary Sponberg Belle et Utile: The Work of the Robert de Vaugondy Family of Mapmakers, 126.